Ohdono Elementary School has its Blue-eyed Doll named Rosemary displayed in a wooden case with a glass front at the entrance to the school building. When I arrived at the school, the principal Mr. Tanaka took the case to his office, and one of the office workers examined the case carefully to figure out how it could be opened. Finally, after a few minutes out came the doll given to the school by American children in 1927. The principal let me take some photos and also let me use the doll in my presentation later in the day. The doll seemed much prettier in person than the photo of the doll in its case on the school's home page. The principal showed me several newspaper articles and other items about Rosemary, and he gave me copies of several of them. 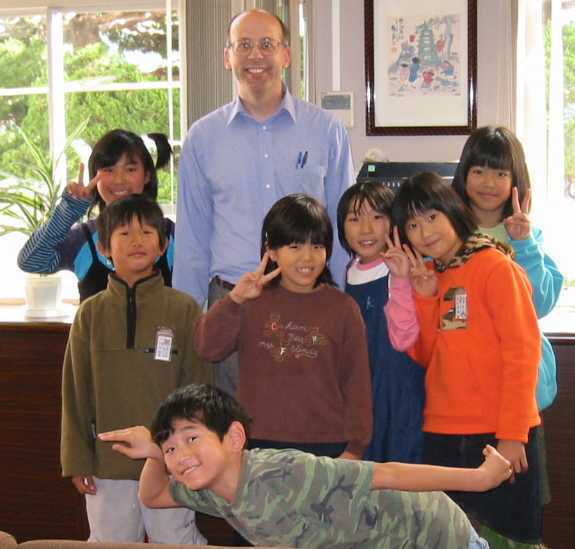 During the second period the children in one of the fourth-grade classes gave short presentations about interesting things in Yamaguchi Prefecture. The children mentioned many names of places, fish, food, animals, and flowers that I had never heard before, so I had a hard time following some of the talks. Sadly I had only one day in Yamaguchi Prefecture, so I did not have time to try out the students' recommendations. After the presentations, the students worked on web pages related to these topics. 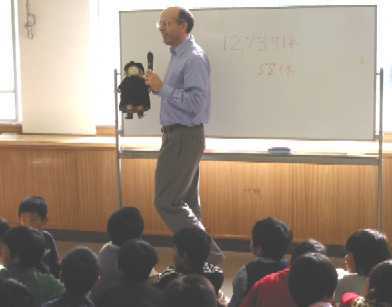 In the next period I gave a presentation about the Friendship Dolls and America to the school's 110 fourth-grade students. Early in the presentation I mentioned that this was the first time I had been to Yamagata Prefecture, but the Vice Principal Mr. Furuya kindly reminded me that I was now in Yamaguchi Prefecture. After visiting Yamagata, Yamanashi, and Yamaguchi Prefectures in the previous two weeks, my mind was a little confused about the Japanese prefectures beginning with "Yama" ("mountain" in Japanese). 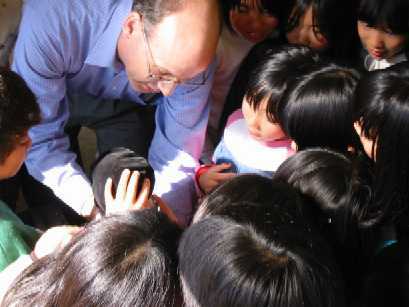 The students knew a lot about the Friendship Dolls when I asked them questions. One boy gave an excellent explanation of what happened to the Blue-eyed Dolls in Japan during World War II. Many students thought the name of their school's doll was Mary (the most popular name for the 12,739 dolls sent by American children in 1927) rather than Rosemary. The students had many questions about the Friendship Dolls and about the United States. 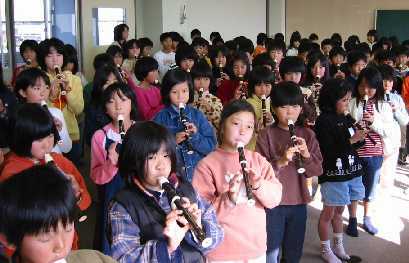 At the end of the period, the students played the song "Momiji" (traditional Japanese song "Autumn Leaves") on their recorders and then sang "We Are the World." After the presentation, many of the girls gathered around the doll to take a closer look at the glass eyes, the eyelids that close when the doll is laid down, the dress, and the coat. Everyone was surprised to see a little pocket inside the coat, and one girl remarked that it was probably for the doll's passport. Although the students were familiar with the doll by seeing it inside the wooden case at the school's entrance, they had never had a chance to touch it or see it up close. After the presentation and during lunch with one of the fourth-grade classes, I signed my name over 50 times on students' hands, papers, notebooks, and other items. They seemed to like the look of English cursive writing. Maybe it was coincidence, but the ink in one of my pens ran out during these signing sessions. As I was leaving, the Vice Principal presented me with a nice pencil holder woven in bamboo that he had made by hand.